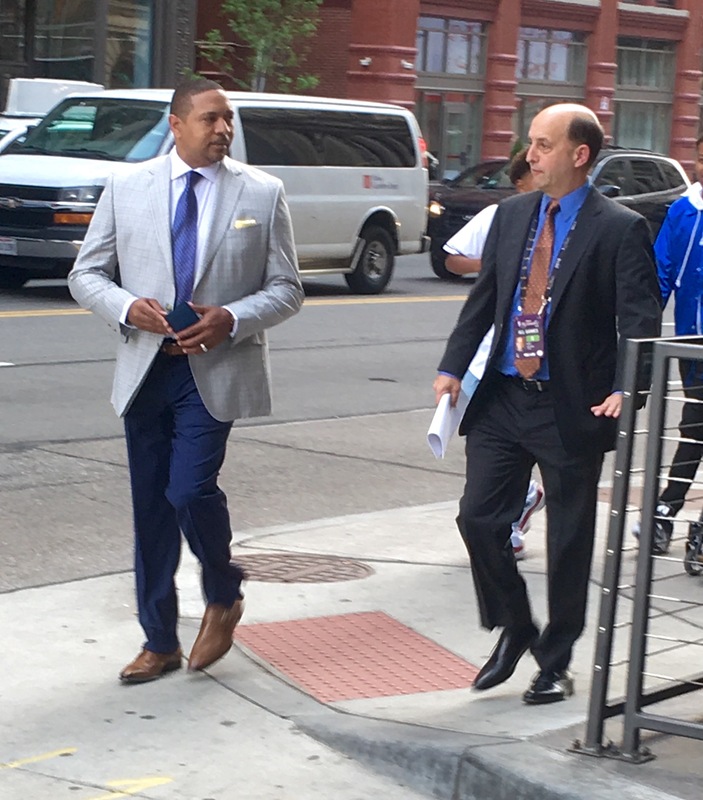 In addition to catching a glimpse of ABC lead play-by-play man Mike Breen walking down a Cleveland street, iFolloSports.com correspondent Lance Martinez also captured this original photo of ABC lead analysts Mark Jackson and Jeff Van Gundy strolling down the very same downtown roadway, prior to Game 4 of the series. The 51-year-old Jackson played point guard in the NBA for 17 seasons, amid a career that includes stops with seven different teams. The St. John’s alum retired with 10,334 career assists, which places him fourth in league history. All told, the 1988 Rookie of the Year averaged 9.6 points, 8.0 assists and 1.2 steals per game. Since his retirement in 2004, Jackson has remained a fixture in the NBA. Amazingly, the 2016 NBA Finals marks the eighth time that he has called the league’s championship series. Jackson left the broadcast table from 2011-2014, when he assumed the role of head coach of the Warriors. In his three seasons at Oakland, Jackson improved the team from 27 wins in 2011 to a very impressive 51 victories in 2014. He was dismissed after the 2014 season, due to his very poor relationship with Warriors management and ownership. The 54-year-old Van Gundy is working his 10th NBA Finals for ABC, after serving as a head coach in the NBA for 11 total seasons (9 full & 2 partial). Van Gundy manned the Knicks bench from 1995 through 2002, leading the club to the playoffs in every single season, except for 2001-02, when he resigned after only 19 games. The upstate New York product resurfaced in Houston during 2003, serving as the Rockets coach for four seasons. Van Gundy once again found success on the sideline, leading the franchise to the postseason in three of his four tries. He was dismissed after the 2007 season, upon never advancing past the first round during those three playoff appearances. Van Gundy and his family still call the city of Houston home. Ironically, Jackson played point guard for Van Gundy, when both men were part of the Knicks organization during the early 2000’s.